It means. In Rwanda it is very much appreciated when you speak a few Kinyarwanda (this is the language spoken here) words. Most people know what ‘Hello, how are you’ in English means, and in my experience they do react respectfully on that. But if you speak some words in Kinyarwanda, the reaction is very different. It seems to open the conversation up, they seem more willing to talk with you. In Yoga class is necessary to speak some words Kinyarwanda. Deirdre can do that well, and i am practicing right now. I have a list of most used words in Yoga, all the body parts, moves (left, right, straight, bend etc. ), words like Inhale, Exhale, left, right, count to ten etcetera. My day started fine. I took my time to wake up. Then went upstairs to the Yoga room in the house and did my practice. Nice it felt, my muscles like this lovely practice. I stretched and found my limitations, went over there a little but i was conscious of not hurting myself. Pushing and pulling, pain and struggling… that’s no Yoga. I am preparing the class i am going to teach this afternoon (all by myself this time). Again in a church with a group of woman who are suffering from the effects of domestic violence and HIV. Should i teach them suffer even more? We want to teach them how to become strong. Strong from the inside, strong in their own bodies. We teach them how to find balance in themselves and feel their own bodies. Become aware of themselves, their strengths and powers. Love their bodies, Love themselves. I thought about the way we sometimes practice yoga in the West. No one in the world needs to or should suffer in yoga practice, but still… we sometimes do. Competition can he high, faces look scared, bodies are in pain… frustration arises, Love flows off and even hate can come in. We would skip Asana (posture) because we don’t like them. They hurt us, they are annoying or painful. They may annoy us because we cannot do them as ‘well’ as we would like, or we cannot do them as ‘well’ as the people in the magazines can. It’s not the posture who does that to us, we do it do ourselves. Our mind does. We push ourselves too hard and forget how to smile. We scare ourselves by dropping into postures too fast when we are just not ready. It’s not the posture that is scary (example back drop in Urdhva Dhanurasana) but we sometimes make it scary by going too fast. Be aware of your fear, embrace the stiff leg, Love your short hamstrings… they will grow, trust them. Be patient. The ladies here in Rwanda need kindness. Like anybody does everywhere. Be kind to yourself. That way we can be kind to others. Hawaiian proverb means: Love gives life within. Love is imperative to one’s mental, physical, emotional and spiritual welfare. A kind word can melt the hardest heart. Look at a situation with love. It changes everything. 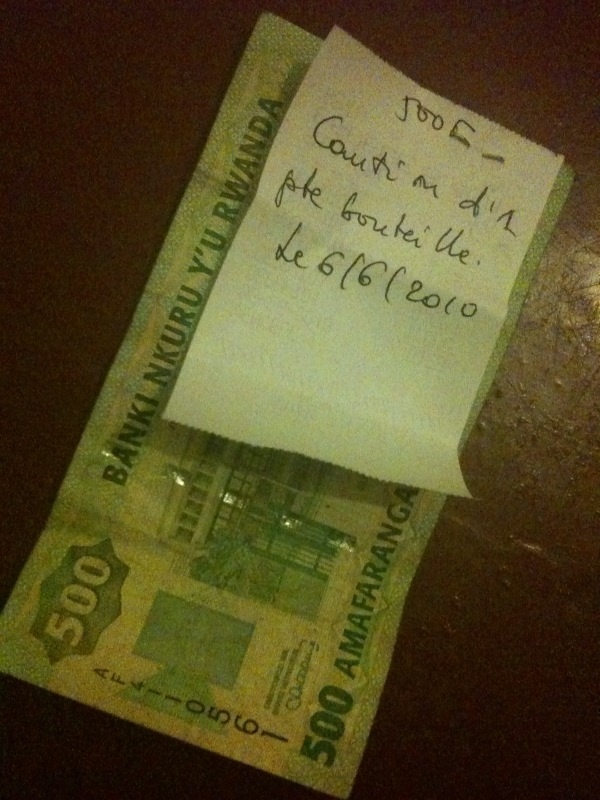 Also today: I taught another class, all by myself i went there with my little paper with Kinyarwanda notes on it. The ladies were great today. They did giggle now and then, when my pronunciation wouldn’t be correct. But that’s good actually, we want them to smile, giggle and even laugh out loud now and then, since there are not many places for these women to laugh outside of this mat… do it! After class they got one hard boiled egg, one glass of milk and one banana. This way they get back some the calories the lost in the yoga practice which they need badly. Cosy it was to sit with them and eat an egg. I like these women! After class, i got home and remembered that yesterday i promised the guy in the little store at the end of the street, that i would return the Sprite bottle after i finished it. So that’s what i did. What i found very interesting and funny to share was their recycle system.